I started having minor issues with my clutch in 2014. The problem was with the clutch hydraulics; the amount of force needed to push in the clutch would sometimes change over the course of the stroke. It felt like something was randomly dragging. It was most noticeable while up-shifting. Sometimes pumping the clutch would make it go away for awhile. One day on the way to work at a stop sign the clutch pedal stayed on the floor. I limped the car home and started investigating. The first thing I saw was that the clutch fluid in the reservoir was filthy. 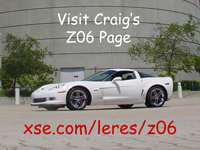 Next I found some threads on the corvetteforum.com and eventually learned about The Ranger Protocol. This involves using a large oil mixing syringe to remove dirty clutch fluid from the reservoir, replacing it with clean, pumping the clutch mix the old and new fluid and then repeating until the fluid is clear. The Ranger Protocol made my car drivable for awhile but I still had symptoms and eventually decided I really needed to be able to bleed the system. I installed a Katech remote bleeder; this was a lot of work as the exhaust intermediate pipe and chassis tunnel plate have to come out. Then I was able to remove the bleeder on the clutch slave cylinder, install the Katech fitting and attach the hose. While I was at it I replaced the clutch master cylinder (GM 12568371). The Katech bleeder kit comes with a braided hose using swivel -3 AN ends. A swivel is great for the clutch end but it's not idea for the end with the brake bleeder end because fluid leaks out the back side when you are bleeding. But being able to bleed the entire system was a tangible improvement. I fabricated a bracket from 1-1/2" x 1/8" aluminum L and powder coated it flat black using a HotCoat kit from Eastwood Company. The bracket is held by the lower bolt on the driver's side hood latch. Now my clutch bleeding procedure is much simpler. I use a MityVac with a brake/clutch bleeding kit. After pulling a little vacuum on the reservoir bottle I open the valve and clutch fluid slowly transfers to the bottle. With the clutch reservoir open and you top it off until you're done.